Innovative Environmental Characterization Solutions: PFAS Groundwater Characterization at FAI | R&M Consultants, Inc. 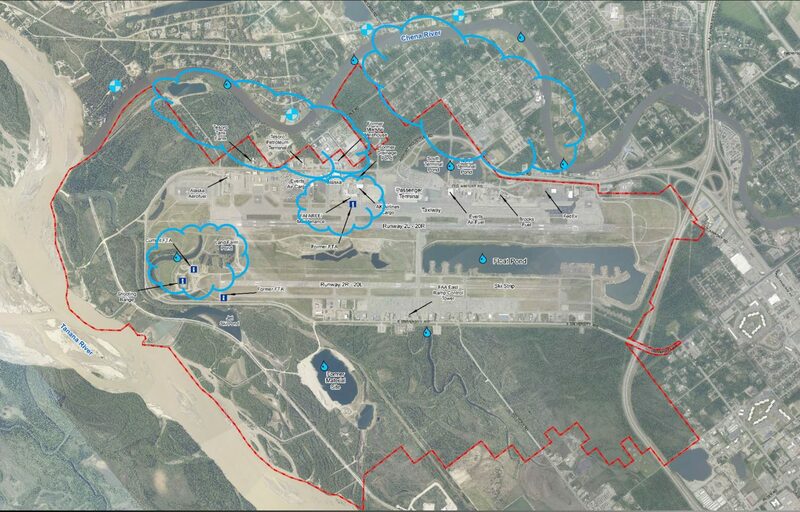 The Fairbanks International Airport (FAI) is actively investigating potential groundwater and drinking water impacts associated with per- and polyfluoroalkyl substances (PFAS) contamination discovered at the airport in late 2017. This activity at FAI was prompted by recent investigations at other facilities where fire training and response using Aqueous Film Forming Foam (AFFF) occurred and resulting PFAS impacts to groundwater affected private drinking water wells. FAI has used AFFF in training and emergency responses on airport property for many years, and initiated investigations following discussions with the Alaska Department of Environmental Conservation (ADEC) Contaminated Sites Program. Initial samples were taken during investigations for other contaminants at the Don Bennett Shooting range site. When results indicated concentrations of two PFAS compounds exceeded established cleanup levels, FAI began plans to sample existing monitoring wells and surface water bodies throughout the facility. Detections of PFAS components (PFOA and PFOS) exceeding cleanup levels prompted immediate searches and sampling of drinking water wells in the area downgradient from the airport. To investigate potential impacts, 156 drinking water wells were sampled at adjacent residences and businesses. The U.S. Environmental Protection Agency (EPA) has a health-advisory level of 70 parts per trillion (about three drops in an Olympic-size pool) for PFAS (PFOA and PFOS components) and ADEC has recommended using 65 parts per trillion as an action level for FAI. PFAS exceeded this level in 61 of the tested wells. Although they are below the health advisory level, FAI also noted any wells testing between 35 and 65 parts per trillion and will monitor them quarterly. Long-term monitoring requirements for drinking water wells testing between the approximately 2 parts per trillion detection limit (below which the laboratory cannot test) and 35 parts per trillion are being discussed by ADEC and FAI. PFAS is considered an “emerging contaminant” by the EPA as they have been used for decades but haven’t been adequately assessed for impacts (and weren’t considered a hazardous substance) to humans until relatively recently. ADEC only added PFAS components PFOA and PFOS to their list of regulated chemicals in 2017. Chemicals in the PFAS family are also common in carpet, clothing, furniture and nonstick cookware. The EPA reports PFAS are persistent in the environment because the carbon and fluorine atoms are extremely well bonded and resistant to breakdown by natural processes. To better understand the transport and distribution of PFAS in groundwater near the airport, R&M will investigate and characterize the nature and extent of the PFAS plume under contract with FAI. Efforts are scheduled to begin in mid-summer after seasonal frost has thawed with a report on investigation findings produced by the end of 2018. Open House #2 to update the public on steps taken and introduce consultants. FAI held an initial public meeting in December 2017 to initiate communication, inform the public of the private well sampling effort, present preliminary results, and respond to questions regarding potential impacts to the environment and human health. 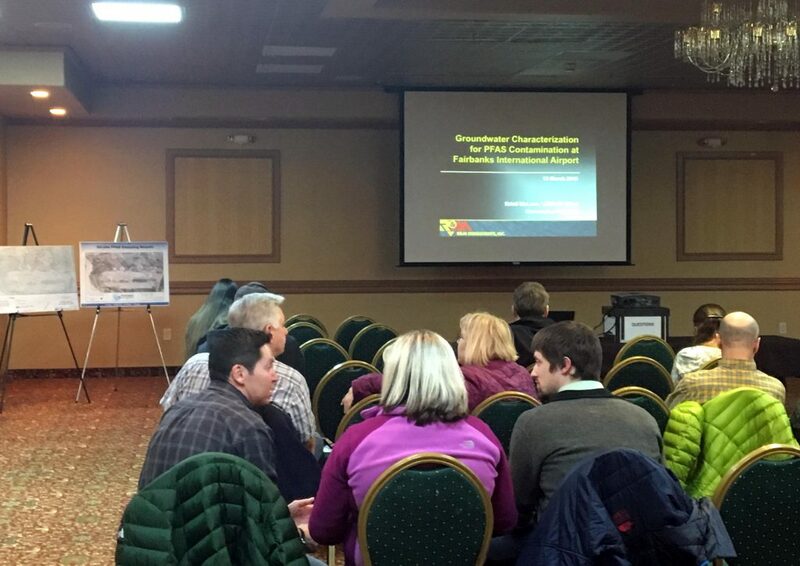 A second open house was held in March 2018 providing information about what steps were being taken to address PFAS contamination and introduce R&M and other project consultants to the community. Additional public meetings will be scheduled as the project progresses and more information is gathered and analyzed. To address the groundwater contamination at adjacent residents and businesses, a project to connect homes with PFAS contamination above the EPA action level to public drinking water is underway for spring and summer 2018. In the meantime, affected homes are being supplied with drinking water by FAI until the water utility connections are made. R&M’s investigation is a major step towards better understanding the PFAS plume and will help with developing long-term plans for mitigating groundwater contamination to help protect human health and the environment at FAI and adjacent properties. Charlie Riddle, CPG; Bob Pintner, PE; Kristi McLean, LEED AP BD+C, CESCL; Christopher Fell, CPG.